Wipe and dry beef. Place in center of slow cooker. Sprinkle evenly with onion soup mix and ranch dressing mix. Cover and cook on low for 8 hours. 30 minutes before serving, add mushrooms and wine or broth. "What type of roast is acceptable for this recipe to be a success? Please respond. Recipe sounds great." 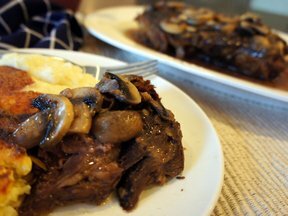 "Great recipe, almost the way I usually prepare pot roast. However,I omit the dry ranch dressing, as it usually contains wheat, and my husband is gluten intolerant. Instead, when the wine, beef broth (I use both) and onion soup mix are bubbling, I add corn starch, mixed with some water and cook for another hour. The corn starch is an excellent thickener for those who cannot tolerate, or are allergic to wheat flour, or items containing wheat." 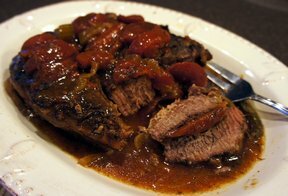 "This was crazy to me to not add any liquid before slow cooking it but it certainly made it's own and was so tender it melted in our mouth. 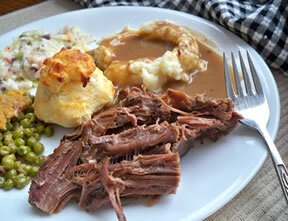 Make some real mashed potatoes to go with this so you can enjoy the magical gravy."